For other people named Thomas Woods, see Thomas Woods (disambiguation). Ludwig von Mises, Murray N. Rothbard, Ralph Raico, Hans-Hermann Hoppe, Ron Paul, Robert Nisbet, Llewellyn H. Rockwell, Jr.
Thomas Ernest "Tom" Woods, Jr. (born August 1, 1972) is an American historian, political commentator, author, and podcaster. Woods is a New York Times Best-Selling author and has published twelve books. He has written extensively on the subjects including the history of the United States, catholicism, contemporary politics, and economics. Woods is proponent of the Austrian school of economics, although not an economist himself. Woods is Host of the Tom Woods Show and Contra Krugman podcast. Woods holds an A.B. from Harvard University and a Ph.D. from Columbia University, both in History. He is a senior fellow of the Ludwig von Mises Institute in Auburn, Alabama and a member of the editorial board for the Institute's Libertarian Papers. Woods is also an associate scholar of the Abbeville Institute, in McClellanville, South Carolina. The mission of the Abbeville Institute is to preserve and present what is true and valuable in the Southern tradition. The fellowship has grown to over 170 scholars and associates. Among other activities, the Institute has conducted annual summer schools for college and graduate students, conferences for academics, and educational programs for the public. Woods was an ISI Richard M. Weaver Fellow in 1995–96. He received the 2004 O.P. Alford III Prize for Libertarian Scholarship and an Olive W. Garvey Fellowship from the Independent Institute in 2003. He has additionally been awarded two Humane Studies Fellowships and a Claude R. Lambe Fellowship from the Institute for Humane Studies at George Mason University. His 2005 book, The Church and the Market: A Catholic Defense of the Free Economy, won the $50,000 first prize in the 2006 Templeton Enterprise Awards. Woods is a founding member of the League of the South, a Southern nationalist organization, and a contributing author to the League's journal, The Southern Patriot. His association has generated criticism but Woods asserts his involvement with the group has been limited. Woods is the author of twelve books. His book, The Politically Incorrect Guide to American History was on The New York Times Best Seller list for paperbacks in 2005. His 2009 book Meltdown also made the bestseller list in 2009. His writing has been published in numerous popular and scholarly periodicals, including the American Historical Review, the Christian Science Monitor, Investor's Business Daily, Modern Age, American Studies, Journal of Markets & Morality, New Oxford Review, The Freeman, Independent Review, Journal des Economistes et des Etudes Humaines, AD2000, Crisis, Human Rights Review, Catholic Historical Review, the Catholic Social Science Review and The American Conservative. Woods was received into the Roman Catholic Church from Lutheranism. He wrote How the Catholic Church Built Western Civilization. For eleven years, he was associate editor of The Latin Mass Magazine, which advocates traditional Catholicism. As a traditionalist Catholic, Woods is also recognized for his books attacking the post-Vatican II church. Woods advocates what he calls the Old Latin Mass and cultural conservatism. 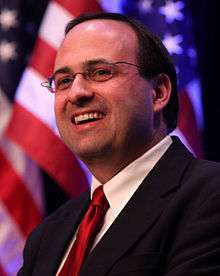 Tom Woods at CPAC in February 2010. Woods makes a sharp distinction between paleoconservative thinkers, with whom he sympathizes, and neoconservative thinkers. In articles, lectures and interviews Woods traces the intellectual and political distinction between the older conservative, or paleoconservative, school of thought and the neoconservative school of thought. The conservative's traditional sympathy for the American South and its people and heritage, evident in the works of such great American conservatives as Richard M. Weaver and Russell Kirk, began to disappear.... [T]he neocons are heavily influenced by Woodrow Wilson, with perhaps a hint of Theodore Roosevelt.... They believe in an aggressive U.S. presence practically everywhere, and in the spread of democracy around the world, by force if necessary. (How they will reconcile their alleged commitment to democracy with the obvious fact that most freely elected governments in the Middle East would be anti-American will be interesting to see.) And they believe that any other country's opposition to their belligerence can be explained only by weakness or moral perversity. They are like spoiled children, both in their thinking and their behavior, not to mention their ignorance of history. It's embarrassing. And although the neoconservatives portray themselves as free-marketeers (as opposed to the allegedly anti-market traditional conservatives or paleoconservatives), this claim is misleading. Neoconservatives tend to want more efficient government agencies; paleoconservatives want fewer government agencies. They generally admire President Franklin Delano Roosevelt and his heavily interventionist New Deal policies. Neoconservatives have not exactly been known for their budget consciousness, and you won’t hear them talking about making any serious inroads into the federal apparatus. Since September 2013, Woods has delivered a daily podcast, The Tom Woods Show, originally hosted on investment broker Peter Schiff's website. On the podcasts, which are now archived on Woods' own website, Woods conducts interviews on economic topics, foreign policy, and history. In September 2015, Woods began Contra Krugman, a weekly podcast, with economist Robert P. Murphy that critiques the New York Times columns of economist Paul Krugman. The podcasts seek to teach economics "by uncovering and dissecting the errors of Krugman." "Kako je katolicka Crkva Izgradila Zapadnu Civilizaciju" Croatian translation (by Dubravka Rojc) of the book "How the Catholic church built western civilization" Teovizija, Zagreb, Croatia 2009. Brownson, Orestes (2003) . The American Republic. Gateway Editions. ISBN 0-89526-072-7. Back on the Road to Serfdom: The Resurgence of Statism. ISI. 2010. ISBN 978-1-935191-90-2. 1 2 3 Naji Filali, Interview with Thomas E. Woods, Jr., Harvard Political Review, August 16, 2011. ↑ "Editorial Board at Libertarian Papers". Libertarianpapers.org. Retrieved 2011-08-10. ↑ "First Principles – Banana Republic, U.S.A". Firstprinciplesjournal.com. 2009-03-02. Retrieved 2011-08-10. ↑ Inferno New Media. "About Tom Woods | Tom Woods". Thomasewoods.com. Retrieved 2011-08-10. ↑ "ISI Announces 2006 Templeton Enterprise Award Winners". ↑ Applebome, Peter (7 March 1998). "Could the Old South Be Resurrected? ; Cherished Ideas of the Confederacy (Not Slavery) Find New Backers". nytimes.com. The New York Times. ISSN 0362-4331. Retrieved 28 September 2016. ...Mr. Woods, one of the founding members of the League of the South. ↑ Young, Cathy (February 21, 2005). "Last of the Confederates". The Boston Globe. Retrieved 2016-09-14. The author's official bio leaves out the fact that Woods is a co-founder and member of pro-secession League of the South. ↑ Young, Cathy (2005-06-01). "Behind the Jeffersonian Veneer". Reason. Retrieved 2016-09-14. Born and raised in the North, Woods is a co-founder of the League of the South, a neo-Confederate group, and has written frequently for its magazine The Southern Patriot. Woods, Thomas (1995). "Copperheads". Southern Patriot. 2 No. 1 (Jan.-Feb. 1995): pp. 3–5. Woods, Thomas (1995). "The Abolitionists". Southern Patriot. 2 No. 5 (Sept. - Oct. 1995): pp. 36–37. 1 2 3 Boot, Max (Feb 14, 2005). "Incorrect History". The Weekly Standard. Retrieved 2016-09-14. 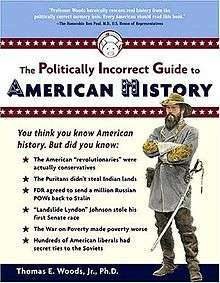 ↑ "Review Essay of The Politically Incorrect Guide to American History by Thomas E. Woods, Jr.". 2014-07-30. Retrieved 2016-09-28. ↑ "LRC Blog LewRockwell.com". Retrieved 2016-09-28. ↑ Woods, Thomas E. (Presenter) (2008). The Catholic Church: Builder of Civilization (Television production). Episode 8: "Catholic Charity". Eternal Word Television Network. ASIN B00C30D3NG. Retrieved 2013-05-21. My personal favorite in this list is Martin Luther because I, myself, am a former Lutheran. ↑ "A Profound Philosophical Commonality by Anthony Flood". Lewrockwell.com. 1987-11-22. Retrieved 2011-08-10. ↑ Beirich, Heidi. "Two Treatises: A pair of recent books attack the Vatican and its current policies form the core of radical traditionalist teachings.". Southern Poverty Law Center. Retrieved 2016-07-17. ↑ Woods, Thomas E.; Ferrara, Christopher A. (2002). The Great Façade: Vatican II and the Regime of Novelty in the Catholic Church. The Remnant Press. ISBN 978-1890740108. ↑ "Sacred Then and Sacred Now: The Return of the Old Latin Mass". BooksForCatholics.com. 2007-09-14. Retrieved 2011-08-10. ↑ "History and Truth: An Interview With Thomas E. Woods, Jr. by Bernard Chapin". Lewrockwell.com. 2005-07-23. Retrieved 2011-08-10. ↑ "Up From Conservatism – Mises Media". Mises.org. Retrieved 2011-08-10. ↑ E. Woods, Thomas. "The Split on the Right". LewRockwell.com. Retrieved 2016-09-14. ↑ "Haley, James W., The Standard Reader, Weekly Standard 01/31/2005". ↑ "Woods, Thomas, A Factually Correct Guide for Max Boot, The American Conservative, 03/28/2005". ↑ On Woods' association with Ferrara, see "On Chris Ferrara"
↑ Also on audio book, as read by the author Thomas Woods. ↑ English translation of Polish title is In defense of common sense. ↑ Woods, Thomas E. "Beyond Distributism". Acton Institute. October 2008. Wikimedia Commons has media related to Thomas Woods.